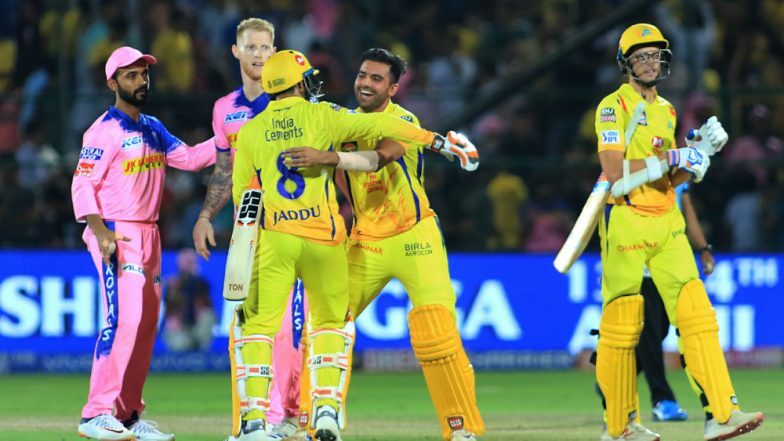 In a thrilling contest, Chennai Super Kings (CSK) defeated Rajasthan Royals (RR) in the Indian Premier League 2019 (IPL 2019) match at the Sawai Mansingh Stadium in Jaipur. CSK chased down 152 with four wickets in hand. The MS Dhoni-led side needed three off the last ball and it was Mitchell Santner’s six that sealed the deal for Super Kings. With this win, CSK continues to be on top of the IPL 2019 points table. 'Captain Cool' MS Dhoni Loses Cool in Final Over of CSK vs RR, Hits Out at Umpire for Retracting No Ball Call. The last over was an eventful one. CSK needed 18 from it. Ravindra Jadeja smashed Ben Stokes for a six and then few balls later, the England pacer dismissed Dhoni. It all went down to the last ball when CSK needed four runs. Stoke bowled a wide and that left Super Kings three to win. Santner then slammed Stokes over long-on to hit the winning runs. MS Dhoni Becomes First Captain to Win 100 IPL Matches, Achieves Feat During RR vs CSK in Jaipur. CSK chase began on a shaky note with the score reading 24 for four. The defending champions lost Shane Watson, Suresh Raina, Faf du Plessis and Kedar Jadhav in quick succession. MS Dhoni and Ambati Rayudu then kept CSK in the hunt with a 95-run stand for the fifth wicket. Rayudu, who was dismissed in the 18th over scored 57 off 47 balls. Dhoni, on the other hand, scored 58 off 43 balls. Most Wickets in IPL: Ravindra Jadeja Completes 100 Wickets in Indian Premier League, Achieves Feat During RR vs CSK Match. # MS Dhoni becomes the first captain to win 100 IPL matches. # Jadeja now has most wickets by a left-arm spinner in IPL. # This was CSK's 14th win over Royals. Earlier, batting first Royals managed to cross the 150-run mark after a cameo by Shreyas Gopal. He scored unbeaten 19 off just seven balls to take his side to a competitive total. At one stage it looked like RR will be restricted to under 140.